This map outlines plans for construction and demolition to be carried out in ten years under Burlington's urban renewal project. The area of focus is between S. Winooski Ave. and Battery St., from east to west, and Peru St. and Main St., from north to south. The brown shading represents a plan to widen Champlain St. to 100 feet with room for parking. The purple-red shading represents a plan to extend Sherman St. to Grant St., while widening it and making space available for parking. The green shading represents a plan to extend Battery Park. The yellow shading denotes an area for the construction of a shopping center and hard goods facility. 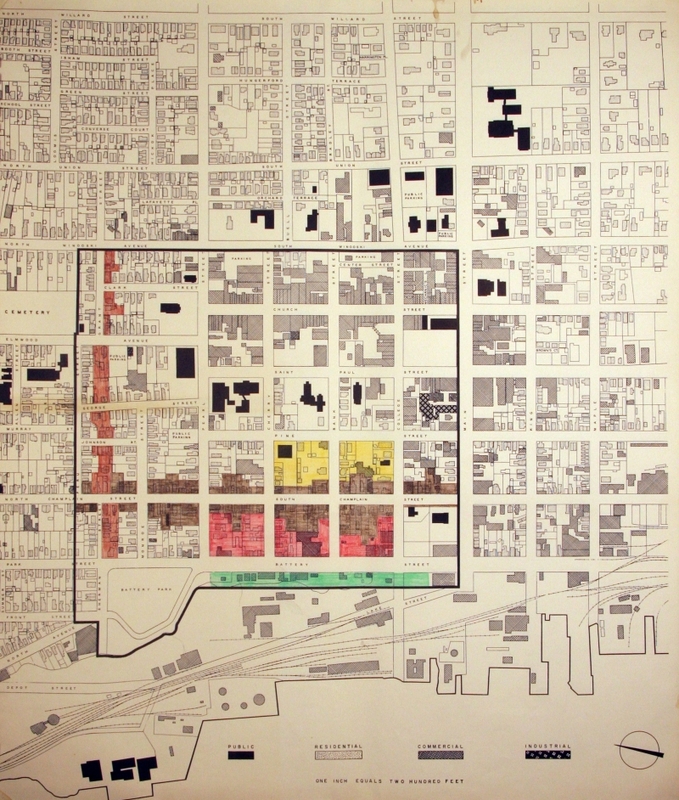 The red shading represents an area where a motor hotel and apartments would be developed.